The left side of the window shows your pal list and user info. If you are using multi-window mode the pal list is 'split off' into it's own window. 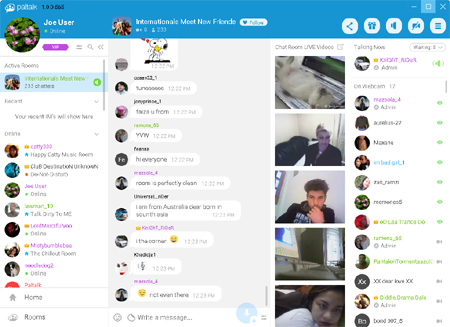 In the center of the window (of left side if using multi-window mode) you can see the group text chat area. Use the text entry area at the bottom of the window to type, send emotes or 'smileys' and stickers. You can also speak to the group by clicking on and holding the blue 'mic' bubble. The blue header on the top of the window shows information about the group and allows you to 'follow' the room. Under the blue icon panel you can see who is talking, and a bit of information about them. You can also see how many people are waiting to speak. If you click on the 'waiting' button a list appears. Who is waiting to talk next? This list shows who is waiting in line to speak. If you want to join in on the conversation and you see a list of people who are already waiting, it would be considered very rude to jump the line ahead of them. Click the 'join queue to talk' button to get in line. As those in line speak, the person next in line will show in the 'talking now' section so you will always know who's turn it is when the person currently talking is finished. When it is your turn you are welcome to 'take the mic' to speak. Click on and hold down the blue 'microphone' bubble to speak. When you are finished speaking let go of the mouse button. You can alternatively use your CTRL key on your keyboard instead of using the mouse. If you plan to speak for an extended time, or you are playing music, it would be inconvenient to have to hold down your mouse button or a key on the keyboard. In this case you would want to 'lock' the microphone 'open'. Click the small 'lock' icon on the bottom right of the blue microphone bubble to 'lock the mic. When you are finished you would then release the mic by clicking the lock icon again, or by briefly clicking the mouse on the microphone bubble, or tap and release the CTRL key quickly. 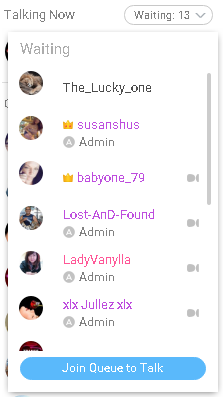 Under the 'talking now' area you see a list of people. This is a list of all of the people who are currently in the chat room. The list is broken into different groups. On the top you see the person who is speaking. You can also tell if people are waiting in line and how many. Next you see 'on webcam'. This area lists everyone who is publishing video to the group. Click on anyone who has a gray camera icon next to their name to view their web cam. If you are already viewing them a green 'eye' icon appears instead of the camera icon. Next down the list are all of the other folks who are listening or chatting in text. Below the 'chatting' group you would see 'restricted' users (if there are any). Restricted users may have certain restrictions placed on them by the 'admin' (administrators) of the room. For example they may not be allowed to speak or type or publish their video. You can interact with anyone in the participant list by right clicking on their nickname with your mouse. When you do that a menu appears with a plethora of options, which we will cover elsewhere.